Rochester, NY – On Thursday, September 26, 2013 the 72 hours expired on the eviction notice from MidFirst Bank for 394 Webster Ave., Rochester, NY. The City Marshal said he’d would be coming by to execute the eviction on the 26th so MidFirst Bank could profit off another foreclosure and eviction. However the Woods Family, neighbors, Take Back the Land Rochester, Metro Justice, Band of Rebels and other community supporters had another idea. The Woods family and their supporters began an Eviction Blockade of the Woods family home on Webster Ave. What started as a front lawn blockade with Home Defenders chained to the porch and forming a chain around the front yard became an energetic celebration of resistance that spilled into a blockaded Webster Ave. that even the police wouldn’t cross. The Woods Family Eviction Blockade spills onto Webster Ave. halting northbound for hours. Even as northbound traffic on Webster Ave. was halted and rerouted by the community, buses, City vehicles, and passerbys cheered and honked in support. It soon became clear that neighborhood support would be holding off the eviction. Rochester police made it clear they were taking an hands off approach for now. Take Back the Land Rochester and community supporters will be continuing their Eviction Watch Encampment to keep a watch on the house and neighborhood and to notify neighbors and news media if any steps are taken to evict the Woods family from their home. This will continue Friday, and then Monday through Friday next week from 9am to 5pm–days and times the eviction can be executed in New York. 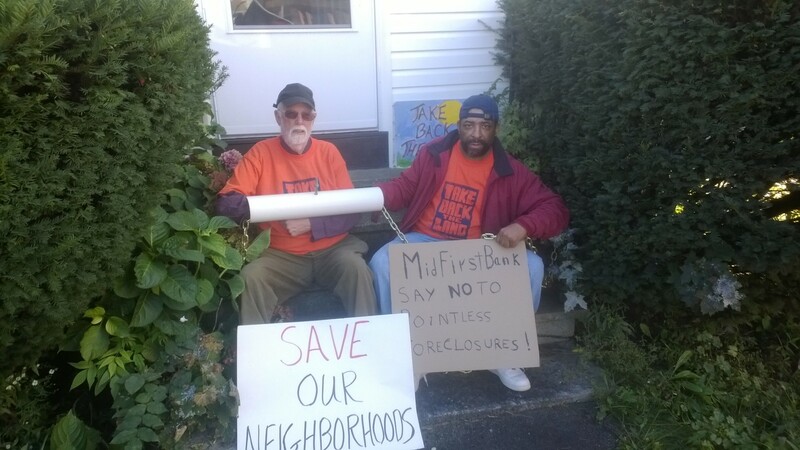 This three year foreclosure fight has culminated in a showdown on Webster Ave. Neither side yet willing to budge. The Woods family, Take Back the Land Rochester, and other allies have pledged to do what it takes to stop the eviction and work out a settlement with the bank. Joe Woods and other supporters were on a nonviolent eviction blockade throughout the day to prevent unauthorized access to the house. Members of the family and supporters are willing to risk arrest if MidFirst Bank attempts to take the property by force. Hopefully, the MidFirst Bank will change their tune like banks across the country that have faced similar resistance and public accountability. The Woods family home is where Glenda and Joseph have lived for 23 years and where they raised their kids. They are willing and able to pay, but Midfirst Bank will next not accept their payments. In 2009, Glenda Woods, like many during the economic crisis, became unemployed and the family had a temporary reduction in income. Although the family resolved their financial difficulties, MidFirst Bank wouldn’t work with them and foreclosed on the family. MidFirst Bank is just latest company to have bought and sold their mortgage including Columbia Banking, Countrywide, Aurora, and MERS. Although the house is assessed at just $28,000, for MidFirst, their house is just an investment. For the Woods family the house means everything. Now MidFirst Bank’s non-offer is for the family to buy the back at $90,000. The Woods family will not be extorted. MidFirst continues to threaten eviction even though they cannot validate how much is owed on the debt, never participated in settlement conference with the family mandated by law, and has been unable to provide the documentation that they are rightful holders of the Note and Mortgage. Incredibly, Republican State Supreme Court Judge Alexander Renzi would not even grant the family a hearing on their foreclosure case despite repeated requests by the family. Given that the Woods family is willing and able to pay it may seem like a “Win-win” for the banks to work out an amicable solution and accept the families payments so they can stay in their long time home. Unfortunately, in a process sometimes called the “Silent Bailout” MidFirst Bank is profiting from the foreclosure and eviction as they plan to receive massive payout from their Federal Housing Authority (FHA) foreclosure insurance. According to FHA, they must evict the family first in order to bailout MidFirst Bank. This little known process of foreclosure insurance gives the banks financial incentives to foreclose instead of working with hard working homeowners and is one of the leading causes of the foreclosure crisis. This is not just the barrier for the Woods family, but the financial dynamics that underpin the vast majority of foreclosures across the country (through insurance provided by FHA, Fannie Mae, or Freddie Mac). TBTL is calling on City of Rochester to commit no resources, including police to enforce this eviction. We believe this eviction is completely avoidable and is not only bad for the Woods family, but bad for the neighborhood and the City. We believe the City should partner with residents in foreclosure to work out an amicable solution, not mobilize police to enforce evictions that will hurt our neighborhoods. If the City commits its resources to support the Bank eviction the house will quickly be ransacked, deteriorate and become unlivable, and permanently vacant and until a city-funded bulldozing years from now. This why we are calling on a City Moratorium on Foreclosures. Like the growing chorus of families in Rochester and across the country, the Woods family is not leaving their home despite the banks’s attempt to take our communities by force. 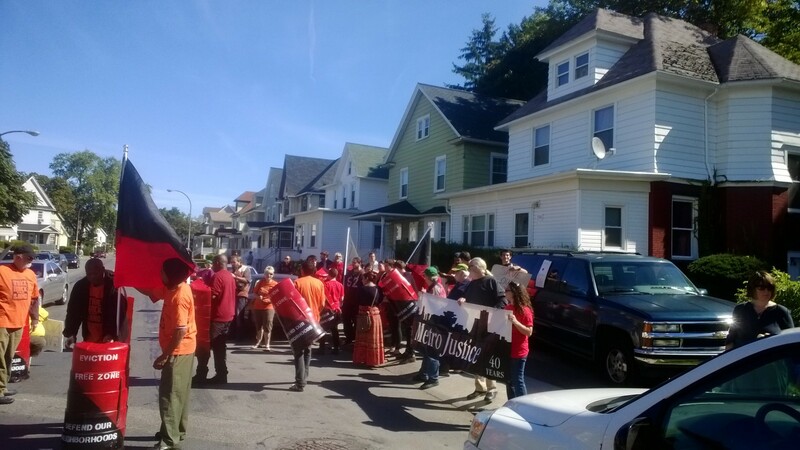 In Rochester, Take Back the Land Rochester and community allies have worked to unite tenants and homeowner in foreclosure to fight their homes and structural changes to allow for the human right to housing and quality affordable housing for all.